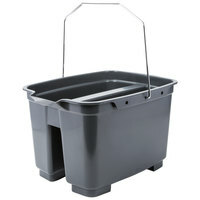 Lavex Janitorial heavy-duty pails will make the cleaning process in your establishment more efficient. Thanks to the divided structure of these pails, they can hold two different liquids simultaneously. Use these pails for a variety of tasks, including wiping down tables, cleaning bathrooms, or sanitizing countertops and prep stations. Once users are finished, a deep spout allows them to easily pour out the liquids. Also make sure to check out other great items from Lavex Janitorial, Noble Products, Continental, Rubbermaid, San Jamar, Unger and Delfield. These Lavex Janitorial heavy-duty pails are designed with the user in mind. Even though they have wells on each side, they’re still balanced to prevent liquids from spilling out. Plus, their lightweight plastic construction enables employees to easily transport them. Additionally, each bucket comes with a handle for convenient carrying. For other great janitorial items, check out our all-purpose cleaning chemicals, microfiber cloths, and window squeegees. If you're wondering where to buy lavex janitorial jugs, buckets and pails, we have a large selection of lavex janitorial jugs, buckets and pails for sale at the lowest prices.